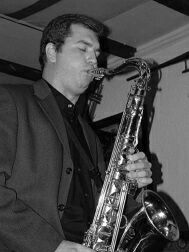 Tenor saxophone player Simon Spillett is probably the best known "keeper of the flame" although in his case it is the Tubby Hayes "flame". His unstinting efforts have brought Tubby's music back into the jazz spotlight with a wealth of previously unheard music from Tubby's own archive now available on CD. It should not be overlooked that Simon himself is a very fine exponent of the tenor saxophone and the music from Tubby's era. His quartet, often with John Critchinson, has been a popular attraction on the club scene for some years. One of Simon's achievements is as author of The Long Shadow of The Little Giant, on the life, work and legacy of Tubby Hayes. The book has a wealth of detail about the British jazz scene of the 1950's and 1960's and is essential reading for anybody interested in this period of our jazz history. Simon Spillett (ts), John Critchinson (p), Andrew Cleyndert (b), Martin Drew (d). Make Someone Happy*/Off The Wagon*/Spring Can Really Hang You Up The most*/Gee Gross*/Another Setting*/Nobody Else But Me*/But Beautiful*/New Beginning*/Howdy Doody*/Cherokee*/Tin Tin Deo (unissued). Simon Spillett (ts), John Critchinson (p), Andrew Cleyndert (b), Spike Wells (d). Mini Minor*/Lifeline*/Souriya*/Peace Pipe*/Rumpus*/Ricardo*/Pint Of Bitter*/The Right To Love*/Sienna Red*/Oleo*/Grits, Beans And Greens (unissued)/Song For A Sad Lady (unissued). Simon Spillett (ts), John Critchinson (p), Alec Dankworth (b), Clark Tracey (d). Shepherd's Serenade*/Square One*/Yesterday I Heard The Rain*/A Night In Tunisia*/Bass House*/In the Still Of The Night*/Wonderful, Wonderful! (unissued)/I Never Know When To Say When (unissued). This page was last updated during September, 2016.